See the first three public projects from “re-IMAGE-n” (2018-2020) Vancouver Biennale. 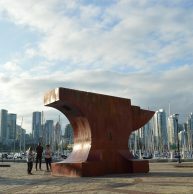 The route takes you from Patricia Piccinini’s Curious Imaginings exhibit in Strathcona down to Leg-In-Boot Square, where you will see Maskull Lasserre’s Acoustic Anvil: A Small Weight to Forge the Sea. 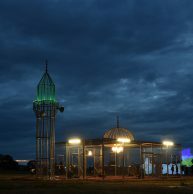 Veer west to the iconic Paradise Has Many Gates by Ajlan Gharem in Vanier Park. Cycling this route will take you via Pacific Boulevard and the Seaside bicycle route.